We knew where she went. When she returned no one ever said a thing. open to her daughters, legal or not. How dare they try dictate what I do with my body? How dare they condemn little girls who were barely out of babyhood themselves? How dare this history be repeated? This entry was posted on July 3, 2015, in camp, nature and tagged animals, camp, nature. 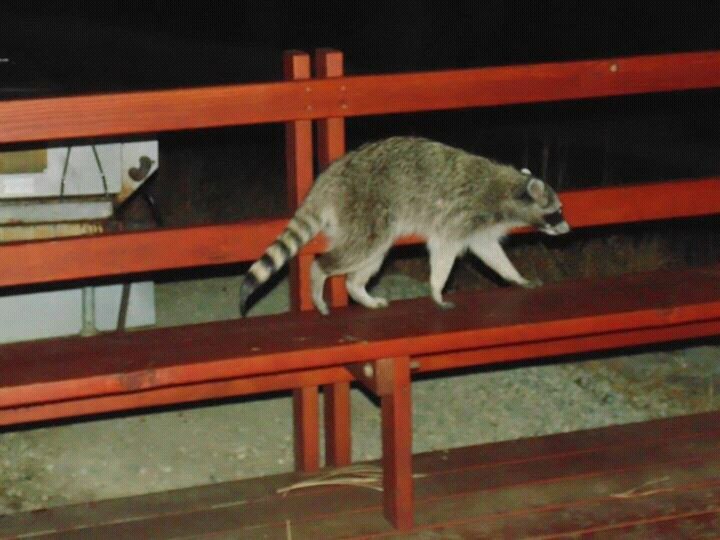 Of all the camps I worked at Singing Pines had the biggest variety of wildlife. According to the camp legend it was because an old Indian woman protected camp. A lot of us believed in her with all our hearts. I have good reason to believe, she touched my cheek once. Scared me into screaming and I had to apologize. That camp has never burned because of her protection the heart of camp is always safe and there is always wildlife harboured there safely. We had a three legged fox and we had bears. We had giant raccoons that weighed around 45 pounds. We had grey squirrels and ground squirrels and field mice. We had a mountain lion that passed through, we had Audubon cottontails and we had rattlesnakes and gopher snakes and we had aquatic garter snakes in the lake. We had bats and we had several kinds of lizards. And we had birds, lots and lots of birds. I was Arts & Crafts Director there for 4 years and for a couple of years I added the title Nature Director too. I had the Long House and the Nature Nook to work out of but I spent most of my time in the Long House above the Lake. I had a refrigerator that ran on propane that only worked the first year I was there after that it was a convenient place to store food away from critters so I didn’t always have to go all the way up to the Dining Hall. It was a long walk up that hill some days. I had a lot of time along out there because there were so many other things to do in camp like horse back riding, canoeing and swimming that seemed to come before A&C unless I was making candles and tie-dye. I had no electricity and a limited budget so there were things I couldn’t do that I had done at other camps like enameling. I did have a propane stove for melting wax and heating dye. So we did a lot of that. And one year I added screening for a select few and the staff. Some days I felt like Snow White in her cottage because the birds went freely in and out of my huge doors. Several times I looked down and a Scarlet Tanager would be hopping in to look up at me in my director’s chair with a cocked head. He always looked like he had a lot of questions he wanted to ask. The Stellar’s Jays were the biggest thieves and loved to steal things especially if some unit had a cook out there on my concrete porch/pad. I once saw one steal a whole cube of butter of the table. The first thing I was ever warned about was to never build a fire during the day in my fireplace because the baby bats in the chimney might fall into the fire and the mama bats would dive down to get them. I forgot this one cold day in my third year and luckily the baby did not fall into the fire but mama did come down to get it and put the baby on her chest. She flew up and hung on the wall looking at me very upset and I hurriedly put out the fire. Baby bats and their mamas are really cute. Mama is at the most about 4 inches long so the babies are really tiny. Anything that can eat 1000 mosquitoes in an hour I like a lot. One night at twilight I had left something in the LH and had to go get it and the bats were just coming out for a night of eating and one poor bat smacked me in the forehead. I guess I was moving too quickly in the door for his sonar to track me. He looked as confused as I did and for the record, he did not get caught in my hair. He just bounced off my head. One night the CIT’s were camping out in the outpost for a skill session and I had gone out there for dinner and went to get my guitar from the Long House for a sing along. In the fifteen minutes I was gone a mountain lion had gone up the road and I had just missed it. I know there were no tracks when I went to the LH and when I came back there were huge cat paw prints. Much as I love kitties that was one I could do without coming face to face with. I told the CIT Directors so they could keep the kids from going to the bathroom until campfire was over because I wanted to keep everyone in the unit until some time had passed. I don’t think we ever told the CITs. Those paw prints were as big as a large size paper plate. Really big kitty. This entry was posted on June 24, 2015, in animals, camp, Girl Scouts, memories and tagged animals, camp, camp memories, girl scouts, nature. This entry was posted on March 10, 2015, in animals, science geekery and tagged animals, science. I was a free range child growing up and nowadays my parents would probably be arrested for letting us walk around on our own. I was driven to kindergarten but when I got to first grade my mom walked me to school once and then my grandmother did the next day but I think it might have been because she wanted to talk to the Scots family that lived on the way to school on the way back. And after that I walked the 7 blocks to school on my own. I walked past the huge KMPC radio towers vast otherwise vacant lot and looked for horny toads and followed mourning cloak butterflies and robins on the way and on the way home. I always had to go by one house that was on a corner that enchanted me. Any adult with no eyes to see probably thought it was incredibly tacky. It had tiny cement squirrels hidden in and around a big deodar tree and plastic birds secreted in the tree and all sorts of magical things hidden in the yard and I had to check on it every day. When we moved to Glendale we had to walk to school down a very steep hill and all three of the schools that we would eventually attend were across the street from each other and of course we walked to school because every one did. Even the kids from the mansions on the hill had to walk. It was just what you did unless you were really brave and rode a bike but our hill was so steep that if your brakes went out you’d end up with a broken arm at the very least and some kids did. At about the half way point down the hill you could turn left and walk on the flat and then head down the hill or you could walk straight down the street. Both were good options depending on your mood. I usually turned left in the morning and went directly up the hill on the way home. If you turned left then there were two magical houses to go by. On the first corner was a kind of spooky house with a huge iron spider web with a spider on it around a yard you couldn’t see in, this was a yard of mystery and imagination and two houses farther on the next corner was my other favourite yard. It had a pond with koi and there were cement animals and gnomes hidden in it again under a huge deodar tree and they had two enormous cement deer in the front yard plus losts of flowers and tree roses. The yards in our neighborhood were minimum of a quarter of an acre and some were whole acres so 3 houses to a block sounds small but it wasn’t. So the yard with the hidden treasures was very enticing and since it was on a corner you got a big view to walk around and see all the magical things. I should also mention that on the north side of street was a house they were always filming something at and the neighborhood kids took great delight in disrupting the filming, at one point it was the main house on the Falcon Crest tv show so they were there a lot. It was modeled on the house Tara in Gone with the Wind and was on an enormous piece of land. If you wanted to walk down or up the street and not turn, that took you by several enticements, the ice cream truck that parked at the end of the street and if you had the coins you could get something like a 7up popsicle or red hot cinnamon toothpicks which for some reason were extremely popular and burned the hell out of our lips. There was also the gentleman that started Johnson Pies and after he sold that he started Johnson Yogurt and he had this huge horizontal freezer by the side of his house and he would sit by the sidewalk and he would taste test the flavours of pie and then yogurt on kids coming home from school. Now, some one would probably report him to the health dept or as pervert but it was fun to try some of them and he was harmless. I still don’t really like yogurt and his was the first I ever tasted. So now our yard is the one that kids drag their grandparents and parents by on walks. We have bunnies and fairies hidden and a fairy door against the house. We have over 15 gnomes (at last count but there are more now) hiding and we periodically move them around because one little girl is certain they move and tells her little brother to look carefully. We like to sit in the house and listen to the kids if they are speaking in English but we also hear Russian and Hebrew, Spanish and Armenian and sometimes Arabic and French. It makes us giggle and it’s a lot of fun. The gnome moving thing is hysterical to my sister and I because my great uncle had a gnome pushing a wheel barrow and he had all of us cousins convinced when we were little that if we were fast enough we would see him move. I love being “that” yard that I loved to walk by as a kid. Making magic for little kids to dream and see is one of my great pleasures and adding some real magic of our own doesn’t hurt either. This entry was posted on March 6, 2015, in fae, magic, memories and tagged animals, fae, memories. This entry was posted on February 26, 2015, in Uncategorized and tagged animals. Once upon a time there was a tiny, tiny owl. He wasn’t a big, majestic Great Horned Owl and he wasn’t a beautiful barn owl. He was a burrowing owl and he had a very strange problem, he was afraid of the dark. The first thing he ever remembered was being rescued by some nice ladies one night from a big field. He couldn’t remember his mother and he couldn’t remember his father. The ladies took him out of the cardboard box he’d been in and put him in a cage and turned the light out and left. When he was put in a cage at the rehab center he was placed between two other owls. They scared him. They scared him a lot. The huge owl next to him kept clacking his beak and twisting his head to look at the little owl. “Whooooo are yooooouuuu?” The big owl said in a breathy voice. “Nobody, nobody at all.” The little owl barely breathed out and went and huddled in his corner and started to cry. He cried and he cried. He didn’t know where he was and he didn’t know why he was here and that big owl made him feel like he was there to be lunch. One of the ladies heard him and came in and saw where he was. “This won’t do.” And she picked up his cage and left the room. “What are we going to do with you?” she asked him. I can’t put you back in there and the other rooms will think you want to eat them and she carried him back down the hall to an office. She placed him on an open space on a filing cabinet. She sat down and looked at him. He looked a right sorry mess. He still had mostly pin feathers and not his real feathers and they stood up around his head and made him look quite silly. “I guess you’ll just have to stay here.” And she dropped a cloth over his cage but he started to cry again. He didn’t want to be alone and he didn’t want to be in the dark. Bad things happened to him in the dark. He thought he remembered having brothers and sisters and not being alone. He started to remember a nice warm nest and nice warm mice for supper. He remembered bumping his head on his mom and dad when they stood in the nest. And he seemed to remember a burrow and a tunnel. Where, oh where was everyone else? The woman didn’t speak owl but she seemed to understand his distress. The last time he had felt safe was with his mom and dad and now it wasn’t safe anymore. He never wanted to be in the dark again, never, ever, ever. This went on for weeks. Every time the woman tried to cover the cage he hooted in distress. If she turned out the light he huddled in the corner and hooted softly until they turned the light on again. Meanwhile he was growing into a handsome young burrowing owl. He was fully fledged in a few weeks and the woman began to take him outside to try his wings. Soon she was letting him fly after small mice to see if he would try to catch them. He did very well. She began to let him do this in the early evening and she did it early in the morning before anyone else was at the rehab center. Though when she came in the morning she did it with a cup of hot tea close at hand and muttered to herself a lot. This made the owl chuckle. Soon he caught every mouse she let loose but he always came back to the woman. She had been hoping maybe, just maybe he would feel brave enough to leave on his own. Finally after several weeks he was put in a big wooden crate and taken for a truck ride. He hooted and clucked to try to talk her out of it but she shook her head and said to him “Hermes, it’s time for you to go.” And she carefully had placed him in his box. He was so confused and he was scared and it was starting to get dark. What was happening to him? It was getting really dark and he hated that bad things happened in the dark to him. But it didn’t stop the truck as it bounced along the dirt road. The truck stopped and the box was opened. Two gloved hands reached carefully in and grabbed him. He was walked for awhile and then set on the ground outside a cozy looking hole and the woman walked away without a glance back. He was on his own and it was almost dark. He huddled down. Now what did he do? As he huddled he started to listen, he started to hear small sounds in the grass near his hole. His eyes started to adjust to the light of the setting sun. Maybe it wasn’t so dark after all and most of all he started to get hungry. He had a feeling that the woman with a nice face wasn’t going to be back to let some nice fat mice run in the grass. He was on his own and he was hungry. He was getting really hungry. He hopped a few steps and leapt up into the air. Wow! This was a lot different from the grass around the rehab center. He climbed a bit higher. He could see where the sun had set. It was still a little pink far in the west. He widened his eyes a bit. He hadn’t opened his eyes fully in darkening light in a long time and he was so overwhelmed with what he was seeing he forgot to be afraid for a moment. He glided on the breeze and looked down on the waving grasses and the trees that were moving slightly in the breeze and he saw something moving in the grass. Dinner! He thought and he dove without thinking about it. He grabbed the running mouse and headed back in the direction of his hole and landed. He made quick work of his dinner. He wasn’t cruel he just needed to do it quickly and not hurt the mouse more than necessary. And then he started to shiver, with his stomach full he started to worry again. It was getting darker and darker. Things were in the dark, bad things and now he was one of the things in the dark. It was weird to think that some one might be afraid of him in the dark. But you can only be scared for so long and then you start to think and Hermes was thinking hard. Last time he was out here alone he was small and didn’t even have feathers. Now he had feathers so he could fly if he needed to. He had nice long talons. He sat there flexing his claws. They were a lot bigger too and that nice lady had taught him how to catch his dinner, maybe they could do other things too. He launched himself back in the air. He floated silently over the meadow. It wasn’t as dark out here as he feared. He saw little sparks of light everywhere. He floated close to where some glow worms were making a path. He saw some mushrooms on a tree that glowed faintly and slowly he noticed something else making light. The moon started to rise in the east. He landed on an oak at the edge of the meadow. He sat and watched as the moon rose higher and higher in the sky. It was big and full and beautifully bright and white with just the right amount of spots to not be perfect and still feel friendly. He felt it was here just to be a night light for him. He flew up and up and up across her face and then he heard a kind voice in his head. “Luna??? The moon?? ?” the owl hooted. “Yes, Hermes. Me. The moon.” It was a soft loving voice. “Always, little one. Just don’t fly so high you can’t get back down. I’m always here even if I shrink so small I’m hard to see. I’ll be your night light. Now go!” she said firmly. Hermes slid back down on the moonbeams until he was back over his meadow. He felt safer now. He had a night light. Whooo knew? Maybe he was going to be alright after all. He waved at Luna and glided over his meadow. It was time to hunt again.